Amid an influx of migrants at the U.S.-Mexico border and upheaval in the top ranks of the country’s immigration officials, Republicans are receiving much of the blame for the state of U.S. immigration policy. A new Morning Consult/Politico poll found nearly half (48 percent) of voters said President Donald Trump and congressional Republicans are most responsible for current immigration policy, while 28 percent said the blame rests with Democrats in Congress. The April 12-14 survey was conducted in the days after Trump shook up the top ranks of the Department of Homeland Security, threatened to release immigrant detainees into so-called “sanctuary cities” represented by his political opponents and was reported to be considering implementation of a revised version of the administration’s abandoned policy separate migrant parents from their children. On Feb. 15, Trump declared a national emergency at the southern border, but Americans’ mixed views on the severity of the problem are little changed since before he invoked emergency powers in a bid to shift some executive branch funding toward border wall construction. Forty-four percent said there is a crisis of illegal immigration at the U.S.-Mexico border, while 33 percent classified the situation as a problem, rather than a crisis, and another 14 percent said there is no problem or crisis at the border. The split is similar to a poll conducted in January amid the government shutdown over Trump’s proposed wall, when 42 percent described it as a crisis and 49 percent said it wasn’t. Voters who viewed the border situation as a crisis in the latest survey were split over whether to blame Trump and the Republicans (42 percent) or congressional Democrats (39 percent) for the state of immigration policy. 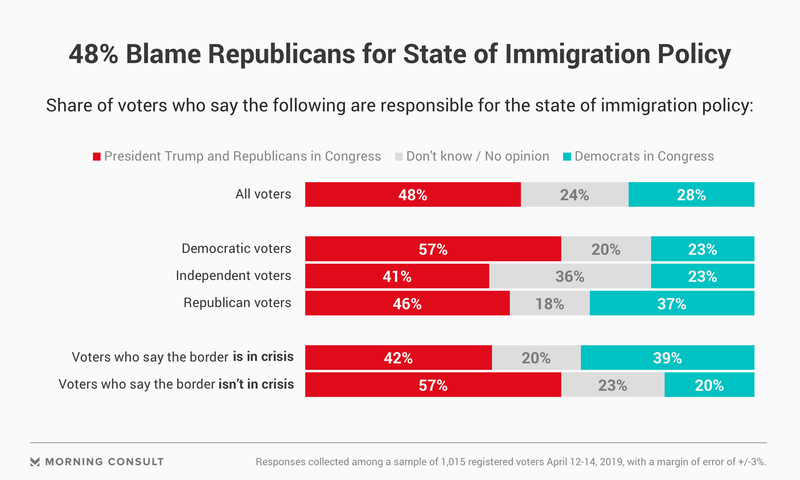 Voters who don’t think the border is in crisis were nearly three times more likely to blame Republicans than Democrats for the situation. Immigration has been a defining issue for Trump since his successful 2016 campaign, and it remains the animating issue for the GOP base. Republicans in the latest survey prioritized building the wall and passing immigration reform over all other congressional issues tested, mirroring sentiment among voters who see a crisis at the border. And while the president may be concerned that a slim plurality of voters who view the border in crisis are blaming him and his party for the state of the country’s immigration policy, the survey also finds most of them are unlikely to express their displeasure at the polls next year: Fifty-four percent of people who see a crisis of illegal immigration said they “definitely” plan to vote for Trump in 2020. The overall poll surveyed 1,998 registered voters with a margin of error of 2 percentage points, while the question on responsibility for immigration policy was split between 1,015 and 983 voters respectively for a 3-point margin of error each.